"M-Audio Fast Track USB Studio, 24/48"
Fast Track USB interface paired with Pro Tools M-Powered Essential software for recording guitar, vocals, and more. Crank up the level of your musical creativity with the power of M-Audio's Pro Tools Recording Studio. Easily craft a hit by creating, mixing, and recording your music on the same digital platform professionals use to produce much of the world's most popular music. Plug in your standard guitar, microphone, and other instruments into our simple yet high-quality audio USB interface play and record directly to your Mac or PC. Even if you're a beginner, your songs will sound like they came from a top recording studio when you pair your inspiration with the ultimate audio production software. Capture pristine digital sound for any recording project with Fast Track USB—whether your guitar is plugged right into the computer or you're using a standard microphone. Create a hit song or soundtrack with M-Audio technology, previously only available to the pros. With far superior sound than standard-issue PC audio cards, Fast Track USB delivers a high quality, skin-tingling audio experience—even if you're just listening. Make music now when you plug in your guitar, microphone or other instruments into our USB interface that connects to your Mac or PC. Fully experience high-quality digital sound when you listen to playback on headphones plugged right into the interface. Adjust your input levels with the included Pro Tools M-Powered Essential software to achieve the perfect sound for your track. Create incredible music right out of the box with the platform the professionals use to record, edit, and produce much of the most popular music in the world. You will need to download the updater for Pro Tools M-Powered Essential 8.0.3 (after installing 8.0.2 from the product box). Then you'll have to download the Fast Track USB driver for Windows 7 (instead of using the one on the disc in the product box). Go from casual playing or singing to full-blown music production in styles ranging from hip-hop and funk to pop, jazz, rock, and blues. Or, use our vast library of drum and instrument loops as an ideal springboard for practicing, jamming, or songwriting. *Home and Professional Editions only. Windows Media Center is not supported. Product information and specifications are subject to change without notice or obligation. I have gotten thisthing to work, it really isnt that hard, you just need to get the windows open and find the play buton.... I'm having issues updating the drivers though, and I'm having some fairly annoying latency issues... I think i know where the problem is though, so maybe it's just a matter of knowing how to set it up. So far I've done a few demo's with it and it sounds great! the latency isnt so bad that you can't play along with the metronome. Turn your computer into a powerful music production studio with the M-Audio® Fast Track®—the best-selling recording interface in its category. Featuring a simple "plug-and-play" USB connection, Fast Track is the easiest way to record guitar, vocals and more with your PC or Mac. Simply plug in your instruments and you’re ready to rock. Fast Track even offers phantom power so you can use professional-quality studio condenser microphones like the M-Audio Nova®. Fast Track is compatible with most popular music recording applications from GarageBand to studio-standard Pro Tools*, and includes easy-to-use Pro Tools M-Powered Essential recording and effects software so you can start making music immediately. Pro Tools® M-Powered™ Essential gives you easy access to many of the same Pro Tools software features that professionals use every day to create Grammy® award-winning albums, Emmy® award-winning television shows, and Academy Award®-winning films. This easy-to-use software lets you create pro-sounding mixes with up to 16 mono or stereo audio tracks. You also get 60+ virtual instrument sounds to play and record, plus EQ and other effects to make your mixes sound professionally produced. It even comes with over 5.5GB of music-making tools to help you get started instantly. 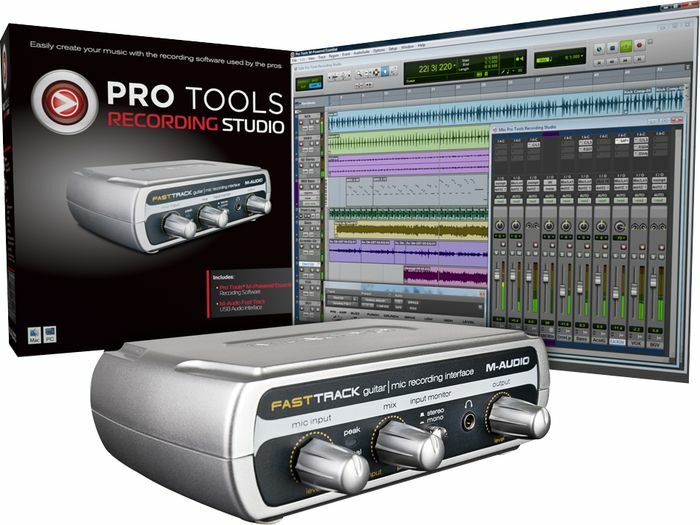 Fast Track delivers all the studio-quality features and tools you need to make professional-sounding recordings right out of the box. With clean preamps and 24-bit/48kHz sound quality, you can be sure your instruments and vocals are captured with better-than-CD quality sound. High-gain speaker and headphone outputs further ensure you’ll hear your recordings with the utmost fidelity. In addition to being compatible with GarageBand, Cubase, Live, Logic, SONAR, Reason and other music production software, Fast Track also works with Pro Tools*—the same recording platform used in countless professional studios around the world to make award-winning albums and film sound. Want to record guitar with your computer? How about recording bass or keyboards? Fast Track is the answer. Simply connect it via USB to your PC or Mac, plug your instrument into the convenient 1/4” input and you’re good to go. You can also use the included Pro Tools M-Powered Essential recording software and effects to layer tracks with your instruments and create professional-sounding mixes. Just about every recording interface has a mic input that accepts dynamic (unpowered) microphones—the kind most bands use on stage. Fast Track is one of the few in its price range that also features switchable +48V phantom power—allowing you to connect a studio-grade condenser (powered) microphone like the M-Audio Nova for pro-quality recordings. The Fast Track interface’s 2-input, 2-output design even lets you record a vocal mic and another instrument simultaneously so you can capture song ideas or collaborate with other musicians. Make music immediately with the included Pro Tools M-Powered Essential—a powerful recording application that enables you to get started creating right away. Based on the same Pro Tools software platform used in pro studios around the world, Pro Tools M-Powered Essential features professional effects like reverb, delay, and more—allowing you to polish your mixes. You also get the Structure® Essential virtual instrument, which offers an easy way add instruments like drums, piano and more to your compositions. Finally, a comprehensive library of included loops helps you construct song ideas quickly and easily. All digital audio recording systems introduce a small delay between the instrument input and the output coming from the computer. This “latency” can be distracting enough to cause pitch and timing errors when you’re recording. Fast Track solves this latency problem with a direct monitor switch, letting you hear your instruments directly through the interface before they go into the computer. Fast Track builds on the success of the popular Fast Track USB—one of the products responsible for the personal and mobile studio revolutions. We’ve listened to our users and added some really cool improvements, including a simplified direct monitoring system, top-mounted knobs that provide easier access to important controls, and a more powerful headphone output level. With a sleek, redesigned chassis, the all-new Fast Track looks and performs better than ever. Pro Tools® M-Powered™ Essential gives you easy access to many of the same Pro Tools software features that professionals use every day to create Grammy® award-winning albums, Emmy® award-winning television shows, and Academy Award®-winning films. This easy-to-use software lets you create pro-sounding mixes with up to 16 mono or stereo audio tracks. You also get 60+ virtual instrument sounds to play and record, plus EQ and other effects to make your mixes sound professionally produced. It even comes with over 5.5GB of music-making tools to help you get started instantly. details. M-Audio Fast Track USB Studio Drivers Update Link. M-Audio Fast Start Quick Start Guide. M-Audio Session With Fast Track USB. M-Audio Session Quick Start Guide.